Whether you're staying in this comfortable holiday home with your family, extended family, or a group of friends, you'll definitely have a fantastic holiday. 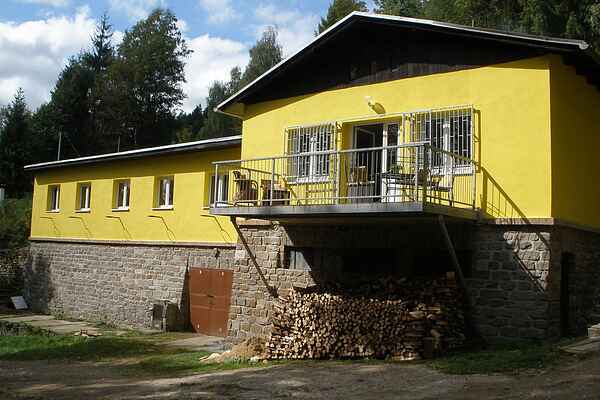 Holiday home Sunny is located at the edge of the village of Nedvedice, in the heart of the Bohemian-Moravian Highlands. A magnificent landscape with plenty of options for mountain biking and wonderful walks. The central location of this holiday home makes it a perfect base for local trips. The beautiful Pernsteijn Castle, for example, lies at 3 km distance. And the historical city of Brno (40 km) is an attractive sight with its rich history and stunning buildings. And of course this second biggest city of Czechia is a good place to go shopping too. North of Brno, you'll find the gorgeous Moravian Karst landscape, with hundreds of larger and smaller caves, many dripstone formations and underground rivers. Well worth a visit! Back at your holiday home, you can enjoy the magnificent views across the valley and the surrounding woodlands from your balcony with garden furniture at the front of the house. You'll find a second terrace (covered) at the back, which is large enough for all the guests to sit down and enjoy a nice meal together. At sunset, everybody can gather around the bonfire for a nightcap. And there's plenty here for the kids as well! There are some toys and in the garden you'll find a trampoline, a sandpit and an old-fashioned carousel. And on hot summer days, they can cool down in the little round paddling pool (3 x 3 m). Cars can be parked at the house.